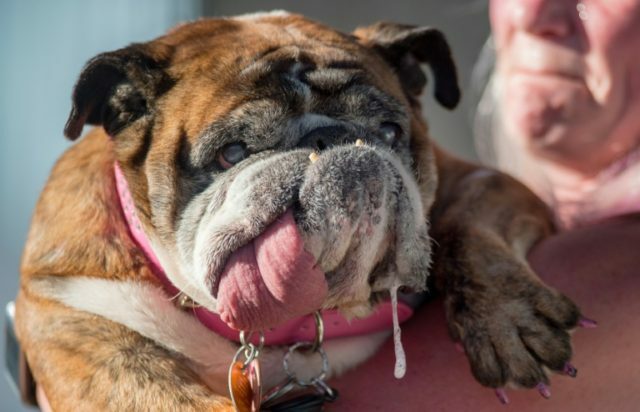 Petaluma (United States) (AFP) – With a lolling tongue and a propensity to drool, English Bulldog Zsa Zsa won best in show at World’s Ugliest Dog competition in Petaluma, California. Zsa Zsa, sporting a hot pink collar and matching nails for her moment in the spotlight, came out on top of a tough field of fourteen. The nine-year-old Zsa Zsa came from a hardscrabble background, spending five years in a puppy mill in the US state of Missouri and being sold at auction before she attained ugliest dog immortality. Other competitors included Rascal Deux, a Chinese Crested who wore sunglasses and a leopard print coat to cover hairless skin, and Wild Thang, a Pekingese all but hidden by a mass of fluffy hair. Martha, the jowly Neapolitan Mastiff who took first place in the competition the previous year, was on hand to pass the baton to Zsa Zsa, whose winnings include a trophy, $1,500 and an appearance on NBC’s Today Show in New York.